Even as the Comelec embarks on a slow canvassing of results of the senatorial and partylist contests and winning local candidates are being proclaimed one after another, many are trying to make sense of the outcome of the May 13, 2013 midterm elections. Disappointment and frustration were the common reactions to the initial, partial and unofficial results of the senatorial race. That is but natural because not all 33 candidates could win and only 12 seats in the Senate are available in each election. In this race, some supporters of the 21 losing candidates – not the losing candidates themselves, take note – were the sore losers, and they shockingly resorted to name-calling, racist remarks and memes, and baseless “analysis” blaming the poor for the victory of Nancy Binay, a daughter of Vice President Jejomar Binay. Nancy Binay, whose thin resume may not get her any important job in the real world, managed to win the support of many voters. Riding on her family name alone, Nancy is just practically waiting for her proclamation by the Comelec. We cannot undo her electoral victory. Only one Liberal Party candidate managed to enter the Magic 12: Bambam Aquino. The other Liberal, Ramon Magsaysay Jr., may not be able to make it. The rest of the winning Team PNoy candidates are actually not partymates of the President. Risa Hontiveros suffers her second straight electoral defeat even after her partylist Akbayan entered into a total alliance with the Liberal Party, turned a blind eye on the Cybercrime Law and other issues against PNoy. My guess is that the voters thought they are already voting for enough pro-PNoy senators, so there’s no reason to vote for Hontiveros who offered the public no compelling reason to vote for her. Hontiveros and Akbayan sold out to PNoy but PNoy couldn’t ensure them of a Senate seat. Teddy Casino of Makabayan didn’t make it, although he outpolled veteran former Sen. Ernie Maceda and socialite and presidential aunt Tingting Cojuangco. Expect Teddy to work full-time in the Parliament of the Streets. Makabayan should be able to sum-up its experiences in two straight senatorial elections and map out a winnable plan and strategy for the next elections. All incumbent Makabayan partylists appear headed for reelection: Bayan Muna, Gabriela, ACT Teachers, Kabataan and Anakpawis. Transport workers’ partylist group Piston may also be able to race to the finish line. This progressive partylist coalition has produced outstanding legislators and champions of the marginalized. Meanwhile, partylist Ang Ladlad again failed to win a seat in Congress. Perhaps the LGBT community should review its strategies and tactics and form as many chapters nationwide so it could secure a victory in the next elections. Media organizations are reporting landslide victories for the ruling Liberal Party, especially in the local races. That may be true but we should ask if these winning candidates are original Liberals or turncoats. Many of them may actually be former partymates of disgraced former President Arroyo. The LP itself was allied with Lakas. PNoy was deputy speaker before he was elected senator in 2007. Social media’s power as a channel of influence was in full display before, during and after elections. The voter conversion factor may be too small or nil, but social media has arrived as a new channel or platform. One TV network had to have a poster of its personnel armed with smartphones to identify themselves with netizens. Netizens and bloggers again launched #juanvote, as their platform for citizen reportage on the conduct of elections. Some in the educated class – disappointed and frustrated yet again by the outcome of the elections which they champion as the only way to achieve change – should seriously address the problem head on. The problem is not the poor. They are faced with the same choices and even more different circumstances. The problem is the electoral system dominated by traditional political parties who disrespect the public, who limit our choices by including people with thin resumes and with only the “right” surnames, and who use both deception and, in other places, violence to get their way. This is the same system that is programmed to allow political dynasties and similar monsters, and demonize progressive, pro-change candidates. Perhaps some of our educated friends should train their intellectual firepower against this system, go to the poor and work side by side with them, and themselves form their own parties to join the elections. Disgraced former president Joseph Estrada completed a remarkable political comeback by defeating pro-PNoy and Liberal reelectionist Alfredo Lim. It was a race that was Lim’s to lose. He was the incumbent and has held the mayorship for three terms. He was also strongly supported by PNoy. But Lim had nearly nothing to show for his long reign at City Hall, and Manila traditionally votes for the opposition during the midterms. Meanwhile, Estrada had much to thank the traditional political system for his rehabilitation from ousted president and convicted plunderer. Gloria Arroyo pardoned him soon after his conviction, a move supported by the church at the time. And then Arroyo out-Erap’d Erap throughout her term, making Erap look like the victim and letting him rewrite Edsa 2 from a legit people’s uprising against a corrupt president to something like a coup d’etat by a few. Arroyo, former President Cory Aquino and the Liberals didn’t challenge that revisionist rendering of history. By 2010, Erap almost regained the presidency with the poor outraged by Arroyo’s own corruption. In short, the restoration of Erap was a process and not just simply a result of Manilans voting him mayor. Many have praised the automated elections and gave a “blanket approval” to the PCOS machines as an antidote to fraud and delay. Make no mistake about it, automation is the way to go. But many have serious questions about the PCOS that both the Comelec and Smartmatic have left unanswered. No source code review. No manual counting to verify the results churned out by the PCOS machines. 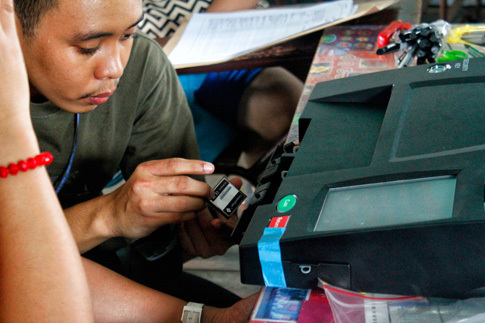 Comelec has not made public a list of PCOS machines that malfunctioned on Election Day and whether those were fixed quickly. There were also reports of CF cards with preencoded results. Automation is not just about the speed, it is also about the accuracy and credibility of the process. IMHO, automated voting machines should have standards for security, reliability and accuracy similar to ATM machines. President Aquino is said to be the ultimate winner of the midterm elections, with most media saying that the landslide win of his senatorial slate is an affirmation of voter support for his administration. Maybe. But both PNoy and the new Congress have tough tasks ahead: To make sure the public actually benefits from the much-touted “economic gains”, “stock market rallies”, and “investment rating upgrades”. They look good on paper, especially on the Inquirer, but the poor and even the middle class have yet to feel these. I have other things in mind – but the most important is that an election does not define a country or a people. It could only provide a snapshot of our people’s current mindset at the time and that this mindset is affected by many factors. Some eke out a living as farmers and tenants in haciendas. Some live a dangerous life in provinces ruled by political dynasties who enforce their will through private armies. Some are not introduced to progressive and new ideas. Each election is an opportunity for us to understand how politics operates in the country. The attitude should not be one of resignation and cynicism, but of boundless hope that we see the problems and of determination that we could find and have solutions during and between elections. Yes, our trapo system is a complicated mess and the solutions may not be as easy as shading our ballots. One of the first bills filed by BAYAN MUNA and ANAKPAWIS each time they get elected is on the issue of labor-only contracting and contractualization. Trade union leader-turned-lawmaker Crispin Beltran started this in 2001. Unfortunately, despite efforts both inside and outside Congress, the bills did not pass the committee level. This is due to strong lobby mounted by Big Business who, quite frankly, have lots of representatives in Congress. Regarding revolutionary taxes, I think activist lawmakers have said so many times that even if they were against it, they can’t stop it. And that it is a result of a civil war. The revolutionaries are building a parallel government. Thus, they impose taxes in their territories. But more importantly, revolutionary taxes aren’t slapped on common people and middle class. According to their public statements, revolutionary taxes appear to be way better than the Government’s. Public records point out that the revolutionaries implement progressive taxation: Higher rates for big foreign business and big local business. Proceeds go to education, health and livelihood programs implemented in guerilla zones and territories. There is no evidence that revolutionary taxes are slapped on poor people and the lower middle class.